Regardless of whether you’re just trying to stay in decent shape, or you’re training for a race, your four-legged friend has the potential to be the ultimate running partner. They’re always available, will never stand you up and are always thrilled to get outside and spend some quality time with you. Through September we’ll be covering the topic of “Running With Your Dog” from a variety of angles to give you all of the information you need to have a fantastic running adventure with your best friend. Our first post will cover the “11 Tips for Running With Your Dog”. 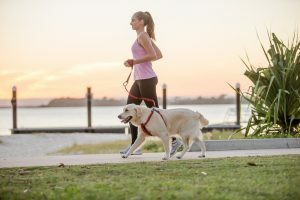 Whether you’re an experienced runner or just starting to get your pooch out for a jog, these guidelines will ensure you both end up happy, healthy and well-exercised. Before putting on serious miles, you want to make sure your dog is the right fit. Certain breeds are natural fits for running partners: retrievers, shepherds and terriers all fit in that category. Toy breeds, giant breeds andshort-faced dogs like pugs are often better suited for a brisk walk. For all the breeds and mixes in between, pay attention to your dog and they’ll tell you if they’re enjoying themselves. In terms of age, you generally don’t want to start putting on serious miles until your dog’s skeleton is fully formed – around 12 months for the average dog and 18 months for larger dogs. Regardless of your dog’s unique situation or breed, you should consult your vet before you get serious about running with your dog. You may be a super-fit experienced runner, but remember that your pooch has a different fitness level than you. 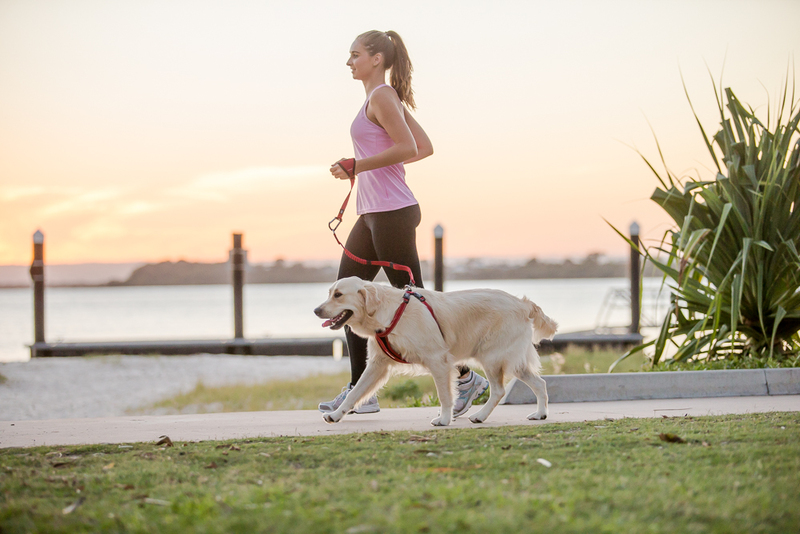 Ease into running with your dog – try a nice run/walk on your daily stroll. Move up to 10-15 minute runs a few times a week, and if your pup is handling that well, you can extend the time/distance slowly over time. If you see your pooch slowing down, breathing very heavily or needing to stop to rest, then you’re pushing them too hard and need to back off your time and/or distance. Remember that they’ll try to push themselves too hard to please you, so you need to be very aware of their physical state and modify your run for them if needed. Just like us, your pooch needs some time to warm up those muscles and joints, so don’t jump right into a 5K sprint or you’ll risk injury to both your dog and yourself. A brisk 5 minute walk to a run/walk to a jog will ease you both into the running mentality and get your timing and rhythm into sync. It’s also a great opportunity to encourage your dog to “get their business done” before you get into the serious run. No one wants to stop for a potty break after they’ve gotten their stride, so if you can get a pattern of your dog using the bathroom during this warmup phase, you’ll both be happier. Especially if your dog is new to running, or not as well-trained as you would like, ensuring that you aren’t on a route with heavy car or foot traffic is important for both your safety and happiness. Give a wide berth to other pedestrians, dogs and cars you meet along the way. As you get more confident with each other, more populated areas are easier to navigate. The surface you run on is as important to your dog as it is to you. Much like a human, concrete and asphalt can be painful and damage your dog’s joints. Additionally, especially if it’s hot out, make sure you check that the surface is not too hot – if it hurts to have your hand on the surface, then it’s too hot for your pooch’s exposed paws. If possible, dirt trails are an excellent option to ensure a safe, comfortable surface. For safety, comfort and performance, it’s highly recommended that running with your dog be an on-leash activity. Nothing says you can’t find a great spot for some off-leash fun while out on a run, but the true running should be done on-leash to maximize effectiveness and safety. 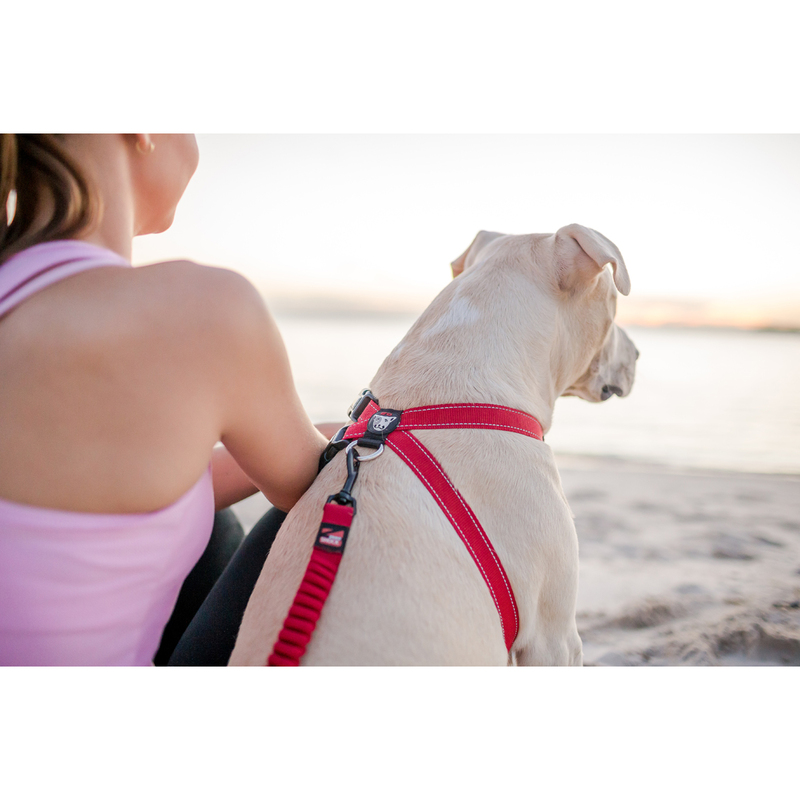 There are many options for on-leash running: classic leashes, zero-shock leashes, hand-free leashes and they can be combined with a variety of restraints: performance collars, training collars and sport dog harnesses. In a future post in our “Running With Your Dog” series, we’ll cover the benefits of each related to the running style of both you and your dog. Even if your dog is the best-behaved dog in the world, it’s still very intimidating for other runners, bikers and motorists to see an unleashed dog. However you choose to keep your dog under control is up to you, but for the safety of both of you, and the others you’ll encounter on your trip, it’s important you consider and choose an option that creates the safest environment for all. Please find a method that works for you. You always bring water for yourself, but sometimes it’s easy to forget to bring something for your 4-legged running partner. They need hydration as well – a general rule is that if you think you’re going to be thirsty, your dog will as well. Even if you have “swimming holes” along the route for your dog, bringing clean, clear water for them on the trip will help keep them from drinking potentially bacteria-laden water. For an easy-to-carry bowl option, bring along a fold-a-bowl and you and your dog can share water from the same bottle. For long runs or hikes, consider bringing food for your dog as well. A dog treat belt is an excellent option for on-the-run snacks, and it even comes with a spot for a doo-bag dispenser. Speaking of those bags….. Beyond the legality issues in most places, not cleaning up your dog’s mess is the single biggest way frustrate anyone else that comes across your path – not to mention it’s just rude. Always have doo bags with you and always use them. Our doo bag holder clips directly to your leash to keep them handy, plus it includes extra storage pockets and a key clip. Or, just stuff a few in your pocket – but make sure you have them and use them! 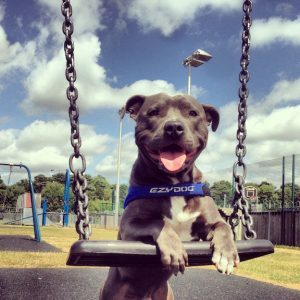 Common sense goes a long way to ensuring a happy run with your pooch, and the weather is no exception. If it’s cold, and you’re wearing a jacket to stay warm, consider the same for your pooch (if they’re not heavily insulated to begin with). 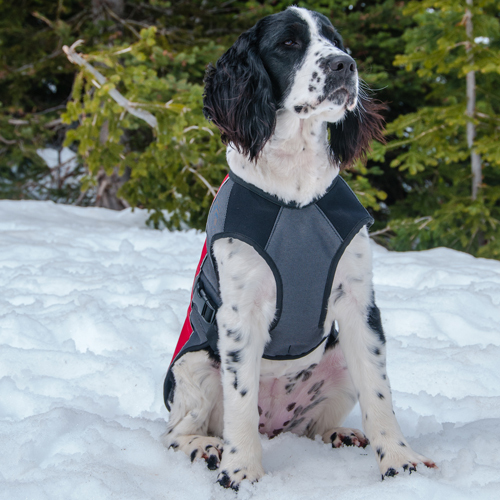 Something like our Element Dog Jacket is a warm, weatherproof coat to keep your running partner warm and dry. If it’s hot out, bring extra water for both of you and consider modifying your route to include a cool swim somewhere along the way. If your dog is sensitive to the sun, or you plan to spend some serious time in the water, consider a dog rash guard to keep them protected from the heat and harmful UV rays. Just like you, your dog shouldn’t go from a flat-out sprint to asleep without some transition time. Build a cool-down period into your run for the last 3-5 minutes – slow your pace, ultimately ending in a short walk to your final destination. This will allow both of your muscles, breathing and heart-rates to slow down gently and ease you back into your daily routine. Make sure you double-check for any signs of overexertion. Excessive panting, extreme sluggishness and very red gums/tongue are all signs of heat stroke and you need to cool your dog down immediately. Cool towels on their back and cool water on their paws should help, but if they show any of these signs get them to a vet immediately after they’ve started cooling down. You should also do a quick check for “trail treasures” like foxtails, burrs, ticks, sheet grass and glass. Look inside the nose, ears, backside, paws, and sides of your dog for any foreign objects. Running with your dog can be one of the most rewarding and strongest bond-building experiences you’ll have with your best friend. Remember that you’re there to enjoy yourselves (both of you) as well as get some exercise. Make sure your pooch knows you appreciate their company and that they joined you on the run by giving them lots of love at the end. However, for serious runs, avoid treats until 30-60 minutes post-run to ensure their stomach has time to settle from the exertion. 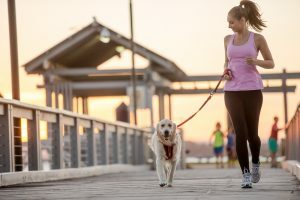 Following these basic rules should be enough to get you and your pooch out together for a few miles of fun, bonding and good-old-fashioned exercise. If you have any concerns about your dog before, after or during a run, please take them to the vet right away to ensure their safety. You may find that your dog is the best running partner you’ve ever had, and your dog just might feel the same way.